The Dynamik Acoustic Sports Wall can ensure you meet current design requirements as set out by Building Regulations (within Building Bulletin 93) and current Sport England guidance with regard to sound absorption. It can be combined with matching solid wall boards in a range of colours that complement the sports floor to give you a complete solution for the internal finishes of the sports hall and create an environment that is aesthetically pleasing. Designed to allow for meeting current design requirements as set out by Building Regulations (within Building Bulletin 93) and Sport England guidance with regard to sound absorption. Developed specifically for busy and demanding sports hall environments. Tested to DIN 18032-1 and DIN 18032-1 for impact resistance to hockey and cricket balls. Fast and efficient installation with unique secret fixings. Fire rated panel options available. 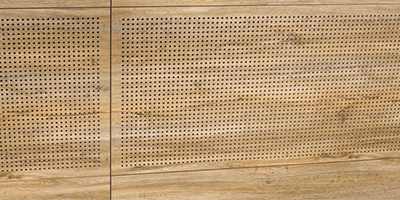 Solid or perforated panels available that run from floor to ceiling and are available in wood effect finishes or in any RAL colour to comply with Sport England Guidelines regarding contrasting colour between walls and floors. 15 mm birch plywood panels finished with a CPL laminate and routed around all edges. Panels available in lengths of 2450 or 1225 mm and heights of 1200, 600 or 300 mm. Black secret fixings designed to sit in the routed edges to provide a consistent 7 mm spacing between panels. Black acoustic membrane to sit behind panels and fixings. Plywood to be FSC certified. The product information below is from the NBS Plus library of product clauses offered in NBS specification products. It has been created by NBS for DYNAMIK Sport. Each product clause is authored in NBS format and is intended for inclusion in project specifications. Please note that NBS product guidance is not a replacement for the manufacturer's literature and it is recommended that DYNAMIK Sport be consulted before specifying.